Record-setting Hawaii quarterback Colt Brennan acknowledged the Aloha Stadium crowd applause after his final scoring pass of the night. 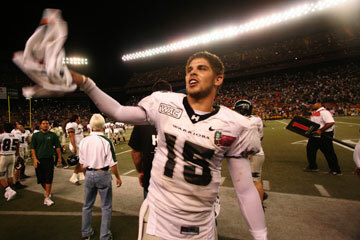 After throwing for five touchdowns and leading Hawaii to a bowl victory, Colt Brennan felt a tap on his shoulder as he tried to oblige the autograph seekers and reporters trailing after him at Aloha Stadium. "Nice pick," Terry Brennan teased after catching up to his son, in reference to Colt's lone interception in the Warriors' 41-24 Hawaii Bowl win over Arizona State. "And you all wonder how I stay humble," Colt Brennan told those within earshot. That interception was part of a slow start for the Hawaii offense. It led to Arizona State's second-quarter touchdown to give the Sun Devils a 10-3 lead at halftime. That would be one of the few times a throw from Brennan wasn't on target. He threw for 559 yards and five scores to break the NCAA's single-season record for touchdown passes. Brennan was named UH's co-Most Valuable Player along with receiver Jason Rivers and closed his junior season with 58 touchdown tosses. His 33-for-42 passing night brought his completion percentage for the season to a staggering 72.6. His performance produced another round of questions on whether it had been his last in a Hawaii uniform, as he considers forgoing his senior season to enter this spring's NFL Draft. His initial answer was cryptic. "I told everybody after the Sheraton Hawaii Bowl I'd answer that, the Sheraton Hawaii Bowl for me doesn't end for me until tomorrow," he said. "I'll talk to you guys sometime next week." But in the next breath he continued, "I'm going to come back probably. It's just that there's things I have to do. I have to be smart and look at the best opportunity out there for me." Some 22 days after throwing his last pass in a loss to Oregon State, Brennan had to wait another two quarters before catching Houston's David Klingler for the NCAA touchdown record. He completed the regular season with 53 touchdown passes, one short of Klingler's mark set in 1990, and tied it with a 36-yard connection with Rivers on UH's first possession of the second half. He then made it his own when Ryan Grice-Mullins caught a swing pass in the right flat, juked the defender and got into the corner of the end zone for a 7-yard TD to give Hawaii its first lead. 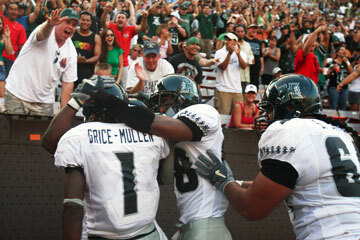 Fans celebrated along with UH's Ryan Grice-Mullins after he caught a TD pass from Colt Brennan that broke the NCAA record for scoring tosses in a season. "It's awesome," Brennan said. "I want to thank Coach (June) Jones and the whole offense for the support they gave me. I know I got the record, but if you watch Ryan Grice-Mullins or you watch Jason Rivers or Nate Ilaoa, you could see I've had good company this year." Brennan completed 14 of 19 passes in the first half, but the Warriors couldn't break into the end zone and went into halftime trailing 10-3. It was the first time since the season opener at Alabama that Hawaii went a half without scoring a touchdown. A second-quarter drive ended with Brennan throwing his 12th interception of the season and Arizona State converted the turnover into the lone touchdown of the half. He also took a hard shot along the Arizona State sideline late in the first half that left him a bit woozy. "It rung my bell, but luckily I had halftime to get ready to go," he said. With his head clear, Brennan came out of the locker room and went 10-for-11 with three touchdowns as UH took a 24-10 lead into the final period. "At halftime, there was no panic, no consternation," UH quarterbacks coach Dan Morrison said. "They had the ball first, they were going to go down and score and turn it around. There's a great deal of confidence (on the offense)." "At halftime we didn't make one change," Brennan said. "We just said, 'Don't make the mistakes, stay confident and let's just win this game.' Once we scored that first touchdown all the butterflies were gone and we started having fun and the floodgates opened." After Arizona State closed to within three at 27-24 with 10:25 left, Brennan led the Warriors on an eight-play, 80-yard march ending with a 21-yard TD pass to Davone Bess. He punctuated his night by hitting Rivers on a slant, which Rivers took 79 yards for the game's final score. It was the 93rd touchdown pass of Brennan's career. And after three weeks of collecting accolades and putting together his best performance of the season, Brennan appreciated the ribbing from his dad as the last player to leave the field. "That's what's fun about my dad," he said. "When everybody gets caught up in the success he's really good at keeping me humble. It's also a funny way of him to saying 'good job.' "